This post begins with an admission: I am, at best, a casual fan of mixed martial arts. By now, any real MMA fan has heard that Ronda Rousey, the UFC Women's Bantamweight Champion, was defeated last night (Sat., Nov. 14, 2015) by a relative unknown — Holly Holm. So the following is my naïve understanding of a sport that I really don't follow closely, and it is with this neophytic perspective (along with my actual knowledge of karate, among other things) that I'll weigh in. Nobody gave Holm a chance. She was regarded as mere cannon fodder for the indestructible machine that the undefeated Rousey has been portrayed as, and justifiably so. Her last three bouts have lasted an average of 22 seconds each! An adept striker, Rousey's real forte is judo, as she earned a bronze medal at the 2008 Olympics. Witness the second and final round of the match. Rousey is forced out of her comfort zone of close quarter grappling by Holm's strategy of maintaining a healthy distance. Holm, a southpaw and a former professional boxer and kickboxer, repeatedly lands crushing left crosses against Rousey's unprotected face. Note the sweet slip Holm gives Rousey at 4:28. 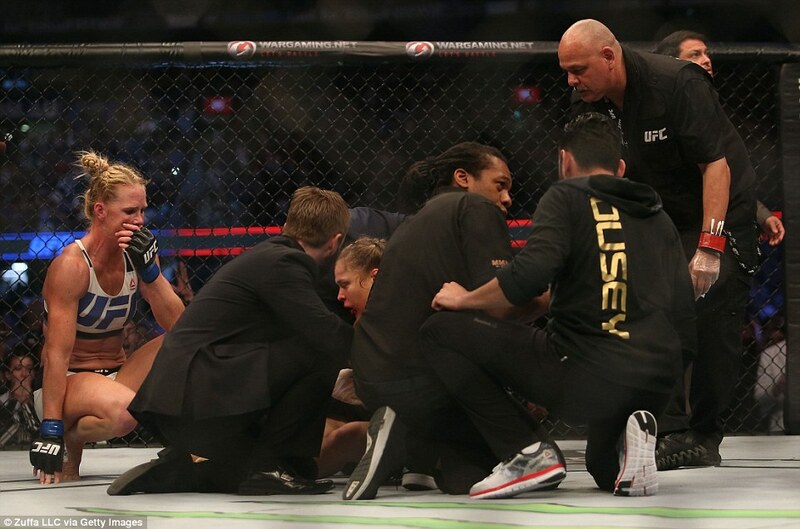 The coup de grâce was a brutal round kick to the neck by Holm. Holm's transition from boxing to MMA may be wiser than she realizes. MMA has been shown to be less injurious than boxing. Many fights don't end up as a ground-and-pound wrestling match. MMA is not merely sportive head bashing, but a highly technical art that deserves respect. Women in MMA can be as popular as their male counterparts. The idea that competitive fighters of any stripe are heartless thugs that lack empathy is largely a myth. The golden age of women's MMA has begun. Indeed, MMA in general is here to stay. Anyone who thinks otherwise is sadly mistaken.